Splitting off part of my original post into a Classicist-specific thread and adding responses from Bromley and Alman that were posted under Suggestions. ColonelApricot wrote: I've been a Classicist for quite a while but have very rarely participated in Classicist games. Why? ---Virtually all Classicist games are standard map, vanilla variant and I like to play premium variants and non-standard maps. I am a bronze but probably could be at a higher rating but haven't bothered. Why? ---The only significant distinction seems to be between Aspiring and the rest. I think it is pretty tough getting seven platinum, gold or even silver level players together. I question whether the admin overhead in maintaining these categories is worthwhile. Bromley86 wrote: Given that you were told in the Classicist forum to post here, it falls upon me to be the bureaucrat that tells you suggestions about the structure of the Classicists belong in that forum . Seriously, you're absolutely right about the Bronze, Silver, Gold, Platinum thing. Aspiring, Member, Kicked: these are the only categories of Classicist that are necessary. Reducing the tedious checking for those in charge will make for a better club, as people waiting for attention are more likely to become disillusioned. While I completely concede the points about the easier bookkeeping and utility of only two categories of Classicist, I also feel that there is something to be said for the gradations. The first reason in favor is human nature. We are prideful people, who tend to be motivated by achievement and competition. Providing additional ranks to motivate one to continue to uphold your status and strive for better are real things. I cite as evidence that this works that while anyone could just join and then leave it be, many make the effort to apply to the upgrades as soon as they qualify. This shows that it has value to people. I myself, after suffering loss of position (from gold to bronze) after an unfortunate accident/oversight, felt the pain of the loss of achievement and I now look forward to my upward restoration as I rebuild my record. Second, there have been (and I believe should be again) occasional "upper" level Classicist games. A couple of years ago there was a couple of games launched as a proof-of-concept and they not only filled, but were quite successful and fun. Again, not discounting the previously stated advantages of a simple 2-tier system, but arguing there are good reasons to keep the current system in place. Mr Speaker, I yield the floor. You are saying in short that the metal categories are a sop to human vanity. That seems a poor use of the hard-working Admin's time. But if it must be so, why not provide a ranked list that lists all classicists in order of games played without blemish and without sanction. The games played part could easily be done via a query on the games database. I suppose the sanctions would require manual intervention but these are rare. 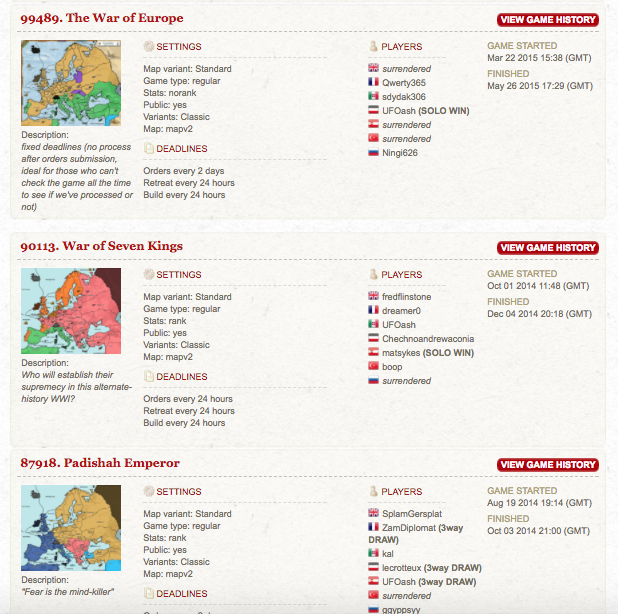 So there were a couple of upper level Classicist games a couple of years ago. I rest my case. For my idea for creating a new player category that is equivalent to the Aspiring Classicist class please refer to the Suggestions thread. Yes, it is a premium feature. Under the Stats tab, you click on Player. Your name appears on the top of the page. If you click that link (or type your name in the blank fields) your stats appear. I've been included in the draws of my last two games, and have definitely solo'd more than once. I got the same stats for you, UFO. Maybe the results you are talking about were in friends games? 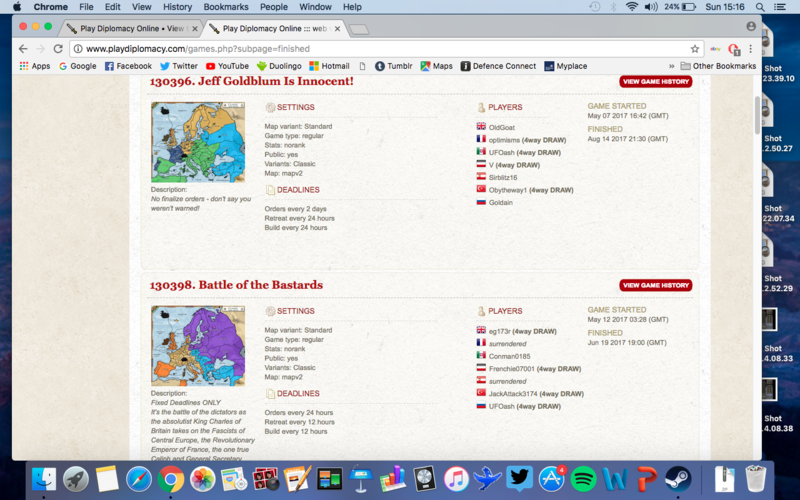 Well just for an example, here are my last two games on this site, and as you can see, I was included in both draws. Unless it only counts ranked matches? Which I don't tend to play very often. Huh. I don't know, UFO, someone with more behind-the-scenes site knowledge will have to sort it out for you. I'm as befuddled as you are! Both those games are unranked. Only ranked games count for most of your stats, with the exceptions of surrenders and NMRs, which are counted across both ranked and unranked games. Looking at getting back into online dip. Still a bronze classicist I think. How does the league work? Where do I find my NMR %? Is this a Premium feature? I have looked through a lot of my tabs and have not found this type of information.